SAN ANTONIO (July 31, 2017) – Abraham Jaquez was elected president and chief executive officer of the Baptist University of the Américas July 20. He becomes the 8th president in the 70-year history of the school. Jaquez, who begins his duties at BUA Aug. 15, succeeds Réne Maciel, who left the university to serve in a church. Jaquez, who has served as the executive director for Buckner Children and Family Services in Dallas since 2011, brings a broad experience in executive leadership. His skills include development, strategy, general management, personnel and leadership. While at Buckner, he oversaw all facility business operations, human resources, and oversight of the flagship campus for Buckner International. He previously worked as a Baptist Student Ministry (BSM) director for 20 years with the Baptist General Convention of Texas. Working in cross-cultural environments, he mentored, led, and developed future young Hispanic leaders on the collegiate campus and ministry marketplace. 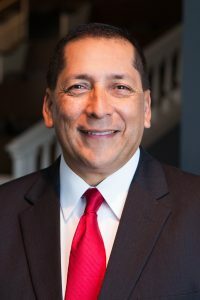 Jaquez holds a Doctor of Education degree in Educational Leadership, Master of Divinity, and a Bachelor of Arts degree in Business Administration in Marketing. Van Christian, chair of the BUA board of trustees said, “Dr. Jaquez received a unanimous recommendation by the Presidential Search Committee to the trustees. The committee is absolutely convinced that Dr. Jaquez is God’s leader for BUA at this point in our history. We are excited about the talents and leadership qualities that Dr. Jaquez brings to BUA. We believe he is poised to lead the university into the next great era of success,” Christian said. Jaquez and his wife Kelly have two children, Gabriel, 12 and Faith, 14. Baptist University of the Américas, located at 7838 Barlite Blvd. in San Antonio, Texas, provides post-secondary education for students from all over the world. Students can earn college degrees and earn certificates not only to enter the formal ministry in churches but also to minister while serving in their service-oriented careers. More information is available at www.bua.edu.